Endoscopes are flexible tubes that allow your vet to look visually deep into the horse’s body. They are either fibre optic (Multiple glass fibre lengths within a sealed outer sheath with an external light source or a more modern digital camera basis. 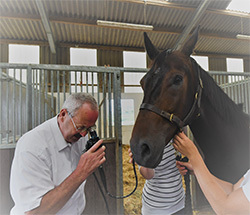 They were initially used to view the larynx (Voice box) of racing horses to assess the condition of ‘roaring / whistling’ prior to proposed surgery. They can give visual assessments of the nose and nasal cavities, ethmoid turbinate’s and the pharynx (back of throat) and Guttural pouches. (these are only present in equines and are distensions of the Eustachian tubes which in a Thoroughbred could be the size of a grapefruit if they were inflated with air) They are part of the nasal anatomy and air travels in and out as pressures are equalised between the throat and ear. They can be placed in the sinuses of the head after a portal is created in the skull to assess sinusitis and sinus cysts. Samples can be taken from different sites within the respiratory tract and a common one is a Tracheal wash where sterile fluid is instilled within the windpipe and then collected. The fluid can be assessed for the cell types (Cytology) and grown to check on the bacteria present and their antibiotic sensitivity. Many of these endoscopes were ex human or purchased from human manufacturers. Since the need for Gastroscopy (visualisation of the stomach lining) we have needed endoscopes of 3 metres length. These have to be manufactured exclusively for Veterinary use as Doctors do not need an endoscope of this length. Gastric ulcers are common in horses especially where low fibre diets are fed. Mostly, they involve the top of the stomach lining (squamous area) and are successfully treated with acid suppressants, omeprazole. Subsequent to the treatments and some cases of poor response, vets have found a different type of ulceration in that it affects the glandular part of the stomach. This condition is harder to treat and requires a mix of medicines along with management changes.